rugby equipment produced in Devon by Richter Engineering. Today we supply Rugy clubs, schools and professional teams with Rugby equipment all over the world. PREDATOR! Rugby Equipment is the brand name of Richter Engineering Co. 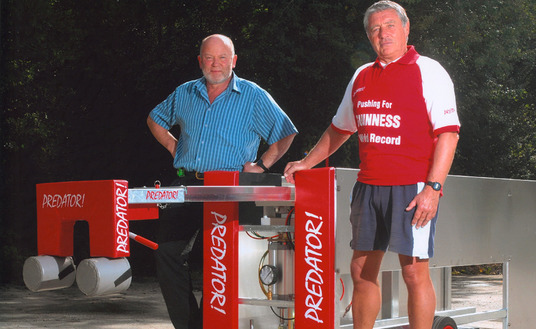 The company began in 1982 when Paul Richter was approached by an inventive neighbour seeking engineering expertise to develop the first roller scrum machine. This became the Rhino Powerhouse family of machines which were built in the Richter works for a number of years. Later we designed improved new models which became our own PREDATOR! Scrum Machines. There is now a wide range of PREDATOR! scrum machines from junior sleds to double-ended roller machines suitable for elite teams. All are made in our original factory in Devon, with Paul Richter still leading the team. 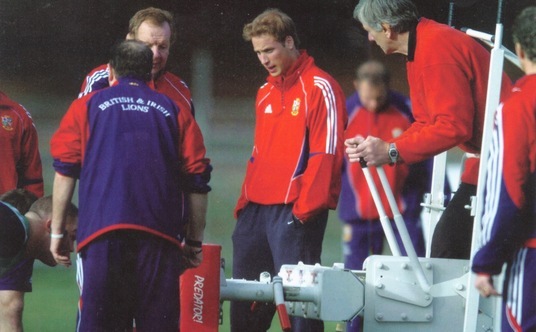 As the reputation of our new brand grew, the British Lions asked us to support their 1997 tour of South Africa with the provision of scrum machines and a full range of other training aids. For us to supply all of the equipment under the PREDATOR! label was a publicity opportunity not to be missed, and thus began our comprehensive range of PREDATOR! rugby equipment. Extending our experience with fabrics and padding materials, we were soon making our own rugby tackle bags, contact shields and contact suits. Offering our growing range of products to clubs and schools, we became aware of the need for rugby balls of excellent quality at a realistic price. Seeking as usual to offer the public excellent value, we found partners to produce the PREDATOR! Rugby Ball. These superb quality match balls have come to constitute a significant proportion of the company's sales. Thousands of rugby balls are imported and stocked at the North Devon HQ, ensuring that they can be delivered to customers on a next day service. The PREDATOR! policy is to supply the best quality rugby ball at the lowest price, unlike other brands with grossly inflated prices across a "range" of rugby balls. PREDATOR! supply one grade of rugby ball - the BEST. The wisdom of training with the same ball type that is used for matches is undeniable. Rugby balls are stocked in 17 different colour combinations in all three sizes to suit almost every rugby team. However, many customers specify their balls to be printed with their own colours, logos, sponsor names etc. In addition to the Rugby Balls, our stocks include Rugby Shorts, Kit Bags, Ball Bags, Corner Poles, Corner Flags, Post Protectors, Training Bibs and Tops, Tracksuits, Subsuits, Headguards and Shoulder Pads, Speed Ladders, Banana Steps (Speed Hurdles), Grid Marker Poles, Disc Marker Cones, Powerchute Parachutes, Tacklebags, Contact Shields, Contact Suits and Tag Rugby Belts, all available for next day delivery. Bespoke playing strip and clothing of all sorts is made to order and can be ready quickly. Full design service available. PREDATOR! Scrum Machines are not the only items manufactured in the North Devon factory. Galvanized Rugby Goalposts, with their exceptional lifespan, are a speciality and Richter Engineering are the sole British manufacturer of Plyometric Boxes.